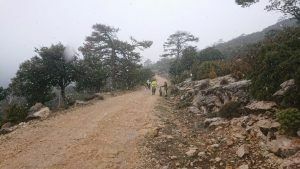 MTB’s 5 routes that la Sénia provides, will allow you enjoy the great views and wonderful places while riding on your bike. The largest route will take us to Morella, where we can stay overnight just to get back the next day by Vallibona. The others will take us to defining places likel Mola de Xert, Ròssec’s road (where the “rosegadors” used to roll down the tres over the Fou ravine). Climbing the Casetes Velles route requires a certain physical training but it is outweighed, balanced by the great views of the Barranco de la Galera, and Caro, and if it’s sunny, by the Montsià mountains and the Delta de l’Ebre. On the descent we will enter in one of the the southernmost beech trees woods of the Iberian Peninsula. Here we can enjoy the presence of the Pare Faig and, a few meters away, if we make a slight detour by the Font del Retaule and the Pi Gros. These are two outstanding heritage trees, that on its own worth the effort to make the route. Water: Source at Font de la Llagosta and Font del Retaule. The Turmell climb might be the most demanding of those you can find in the area, but it is worth doing it. Besides, the way down is one of the most entertaining. The way back from Vallibona will force us go up to Mas de Prades again, but turning on La Pobla and Els Estrets will leave us satisfied. Water: we can find sources in the different villages where the route passes. The whole route is requires a certain physical training, but enjoying the climb on Vallcaneres, all the views of Barranc de la Fou, enjoying the GR7 ride that will take us to Refugi de la Font Ferrera, riding the bike through Trencacaladres de los Prats ravins, climbing from Molí Joaquin to Coratxar, and riding from Boberal de Castell de Cabres to Torremiró up to Morella, is priceless. Once you have finished the route “La Sénia – Coratxà – Morella”, and spent the night at Morella it is time to come back. We take advantage of the valley of the Servol river, and enjoy the ride on one of the best tracks on our territory, due to the good accessibility, the route conditions and also to the great landscapes on our way. 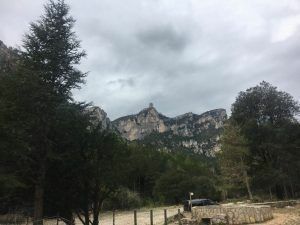 You will just have to put a little bit more of your effort to get from Vallibona to Mas de Prades, but all the way down to la Pobla and the section on los Estrets del Ballestar up to ithe lake is amazing. Although it is hard uphill route, is worthy climbing up to Mirandes. We can enjoy the views of Racó del Fatjos, and we divert from the route to get to Les Mirandes. 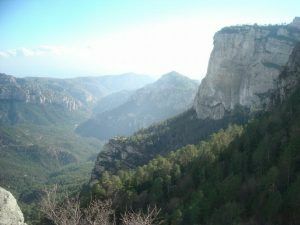 The name itself defines this place as it is gives us an exceptional overlook on the Barranc de la Galera and Caro. You should be careful if you suffer from altitude sickness. We take the way back to La Sénia on the Ròssec path, that in the ancient times (until the mid-twentieth century) people used it to to get the wood down from the forest (Vallcaneres) to the village in oreder to use it for furniture. It is a long worthy, technical rocky lane. Water: We can find diferents sources (Font de Pallerols, Povet dels Plans, Font del Retaule, Font del Teix).